Plastic Pollution Reduction in Macclesfield? David Attenborough's Blue Planet II was shocking, and together with Drowning in Plastic, left us wondering what we as individuals could do to reduce the problem? This website aims to answer that question, offering a menu of nine simple strategies. 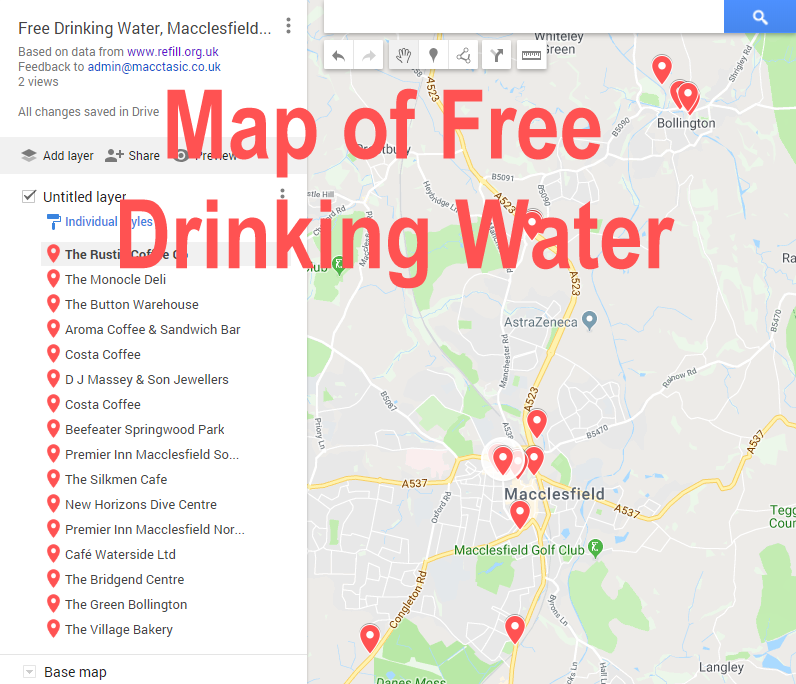 Macclesfield is a long way inland and, like most developed western countries, most of our waste is well managed and doesn't find its way into the sea - apart from litter that gets into the drains and rivers, and plastic items flushed down the toilet. 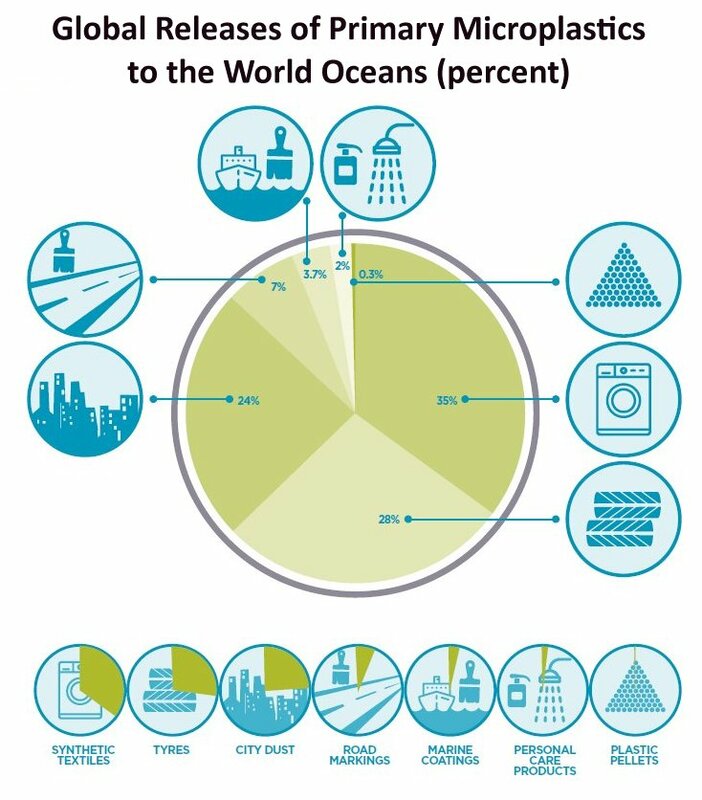 But if we consider only micro-plastics, (pieces smaller than 5mm) western developed countries have more work to do, being the largest contributor to micro-fibres from washing machines and micro-plastics from road run off. 30% of fish caught in our UK coastal waters contain traces of micro-plastic. Lots of the big changes, such as the proposed deposit scheme on bottles and cans, are being made by government and trade associations, but this website suggests ways you as an individual can make a difference - by your own actions, and by influencing others. If we reduce the number of single-use items sold to the public, we reduce the 'opportunities' to discard them as litter. 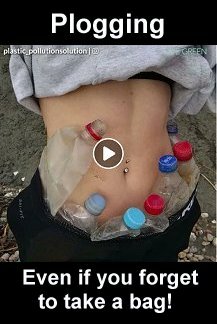 But the idea of a simple 'War on Plastic' risks throwing out the baby with the bath water. Durable plastic products have served us well in many aspects of daily life - from near-indestructible toys, to reducing the weight of our cars, making them more fuel efficient and safer. The key to ocean pollution by items bigger than 5mm, lies in understanding and reducing litter and fly-tipping. Plastic items put into a bin, (any bin - recycling or not), will be managed properly, and won't find their way into drains or rivers. Previously, this litter has seemed mainly a cosmetic issue; but now we are aware of real casualties from this problem. Fortunately, Blue Planet II struck a chord in China; reportedly the internet was slowed when around 80 million people watched the second episode. Theresa May (rather pointedly) gave president Xi Jinping the box set when they met in February 2018. What Can be Done about Litter? If an area is clean, no-one can claim their new litter makes no difference. Pick up a few bits of litter each day when you walk the street or your local park. Every little helps. Clean areas attract less litter. 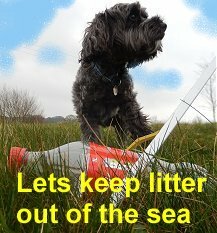 By being seen to clean up, you will encourage others to clean up too, and you promote the idea that litter is not OK .
Dog walkers tend to have preferred routes, and could easily 'maintain' them - and improve the environmental image of dog walkers at the same time. When you are at the seaside, pick up a few items of litter. Runners in Sweden are encouraged to try Plogging (collecting rubbish as you run). Ask your council for more litter bins in the street, and maybe try one of these Top 7 Anti-Litter Campaigns . The successful Keep Britain Tidy 'Bin it for Good' scheme rewards bin use with charitable donations. Publicise the effect of litter on marine life. Download and print these A4 posters. Appeal to local pride, and engage community action. Encourage residents to clean up (and maintain) their neighbourhoods. Find your neighbourhood group. The Don't Mess With Texas campaign harnessed local pride and endorsements by celebrities to target 18 - 34 year-old males, and was credited with reducing Texas highway litter by about 70%. Disposable Nappies add to plastic use, but tumble-dried reusable nappies have a higher carbon footprint. Use a clothes line to dry them when possible! 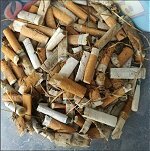 Cigarette Ends, made from cellulose acetate, are the world's most common item of litter. They take 10 years or so to degrade, and travel from street gutters via drains, and rivers to the sea, where they are picked up by birds. These 500 butts were collected in one beach clean. Chewing Gum is the world's second most common item of litter. These paper wrappers can be re-used to prevent discarded gum sticking to everything - an 'advantage' not offered by packs of sugar-coated gum. Apply the new £150 fines for littering. Small fines, rarely applied, trivialise the problem. Large fines that are applied, send a signal 'Litter is Damaging'. Introduce the deposit scheme on plastic bottles. The UK uses a staggering 38.5 million single-use plastic bottles every day, of which more than 40% are not recycled. In addition to encouraging people to recycle their own bottles and cans, The deposit scheme will encourage people to pick up littered bottles to claim the deposit (as in Germany) - before they get into the sea . In Norway, recycling rates are at 97%. (That's only 3% not recycled, compared with our 40%). Although PET bottles sink, the bottle tops float - and appear to be a tasty morsel to sea birds and larger fish. So there are suggestions that the tops should be somehow made captive on the bottle - such as flip-tops. Why does Litter Persist? Keep Britain Tidy published a paper on their website 'Using behavioural science to reduce littering: Understanding, addressing and solving the problem of litter' . The main points are summarised here. Coffee Cups: Each year in the UK, fewer than 1% of the 2.5 billion paper coffee cups used are recycled. Support coffee shops that are working to reduce plastic such as on Churchill Way. Take a re-usable (insulated?) mug for your coffee purchases, and get a discount. 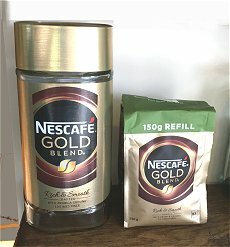 Reducing the base price and charging a 25p surcharge for the disposable cup, giving the same net price, worked better in a trial at Winchester University. It seems we hate a surcharge more than we love a discount. Interestingly, Starbucks are introducing a surcharge of 5p for a disposable cup. Will it be as effective as 5p on plastic carrier bags was - reducing use by 85% ?! Coffee Cups CAN be recycled in Cheshire East. Tear the cup, breaking the wax seal and allowing the chemicals used in paper making to 'get under the skin', and put it in a Silver Bin. Ask them to change, or at least use compostable equivalents. Many of these items are heavily contaminated with surplus food, so it makes sense if they can be composted together - not in domestic compost heaps (not hot enough), but in commercial in-vessel composters, such as Cheshire East will have in 2019. Compostable container prices are now only 5p - 10p more than styrofoam. Ask your local take-away why they use plastic trays rather than aluminium foil or compostable bagasse? Show them this list of alternative suppliers. Why use plastic cutlery rather than wood? Can they at least offer their customers a choice? McDonalds have announced that they would switch their 1.8 million plastic straws per day to paper in September 2018. Sign the petition to ban plastic straws here. Use paper straws, or try one of these..........? As with many aspects of sustainability, textiles is a subject full of trade-offs. Synthetic materials such as Nylon, Polyester, and Acrylic, use very little water in production, but consume fossil resources, and their laundering releases millions of micro-fibres into water courses. Cotton, in contrast, is a natural fibre, but uses large amounts of water in processing. (It takes about 8,000 litres for a pair of cotton jeans - though over half of all cotton is rain-fed rather than irrigated). The fashion industry is the world's second largest polluter - after oil and gas. 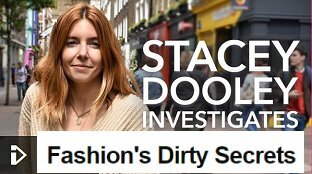 The colouring dyes used in cotton production pollute water courses - as detailed in Stacey Dooley's 'Fashion's Dirty Secrets' . Cotton growing also accounts for 7% of pesticides used in the USA. Wool, on the other hand, seems quite sustainable - apart from sheep burping greenhouse gases. Polyester Fleece is thought to be one of the biggest emitters of micro-fibres due to its construction. An alternative is woollen fleece. 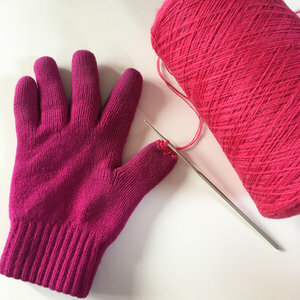 Acrylic fabrics, (mostly sweaters, socks, and fleeces) are the worst, shedding about 50% more fibres than polyester fabrics. Which fibre types are the most sustainable? Buy Fewer New Items: It is claimed that 60% of clothing is discarded within a year. About half of what we buy use natural fibres such as cotton and wool; a third is synthetic; and about 10% is made from viscose/rayon (derived from wood cellulose - i.e. tree felling). Keep Clothes for Longer. Think twice before replacing a serviceable garment with a new one. This reduces your consumption of resources. Cherish the clothes you have. Buy better quality to last longer. Let fashion changes pass you by. Learn How to Mend Clothes: For example The Tailoring Academy on Pickford street run drop-in sewing classes. 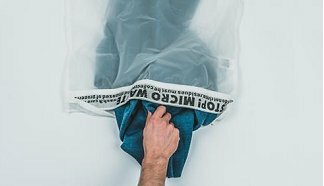 Patagonia offer tips on maintaining clothing . Don't buy new: The first washes of a new garment release significantly more fibres than subsequent washes. Check out your local charity shops or clothes up-cyclers before buying new - and maybe get a designer label at a good price? When You're Done With Them, don't throw them away. In addition to the charity shops Marks & Spencers have in store collection points, and reGAIN have an app that enables used clothes to be exchanged for discount vouchers on new clothes. 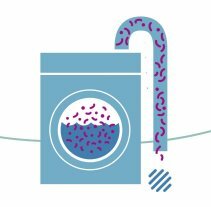 Fabric Washing is the major source (35%) of micro-fibres in the ocean, with a typical 5kg wash load of polyester fabrics producing six million micro-fibres. Water treatment filter plants around the country can remove 65 - 90% of textile fibre fragments from waste water, but they are then contained within the (mostly organic) sludge residue, that is either applied to the land as fertiliser, or dumped at sea(!). We need to ask how that can be improved? Wash Less Often: At home, an obvious first move is to consider whether you are washing more often than necessary? How often do you really need to wash clothes, towels, bed linen? There is a potential saving of water, and energy used too. Wash Programme Selection: Shorter, gentler, wash programmes with lower temperatures release fewer fibres. Wait until you have a full load for your machine; the clothes move around less, and break off fewer fibres. Tumble drying is best avoided as it beats the fabric, making fibre damage more likely. If you can dry your clothes on an indoor airer or outdoor clothes line, that risk is minimised - and you save energy too. If your machine has a lint filter, don't clean it out by washing the lint down the drain; put it in a bin. 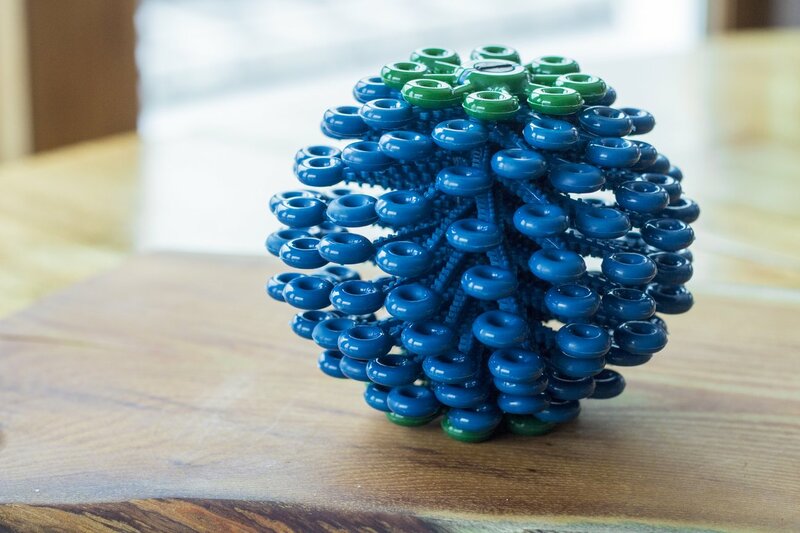 A 10cm diameter recycled plastic ball, which claims to retain 25-33% of fibres in every wash.
You pick them out of the ball when they have accumulated. Claimed retention of around 80% of fibres. The fibres accumulate in the corners of the bag, where you can pluck them out and bin them. 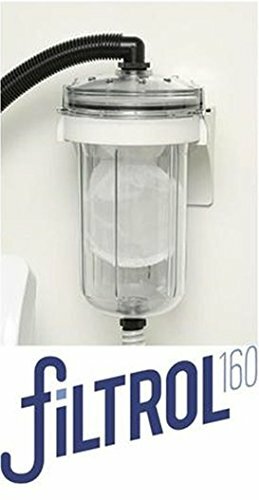 An outlet water filter is available for about $150 in the USA, but presumably there is a risk of becoming over full and causing a flood? 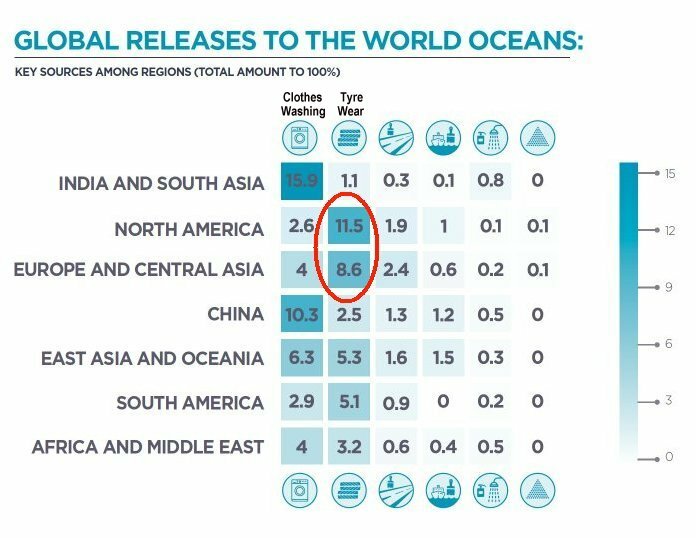 Ocean Cleanwash has an analysis of the problem. Disposable? Think twice about buying anything with the word 'Disposable' in the description. 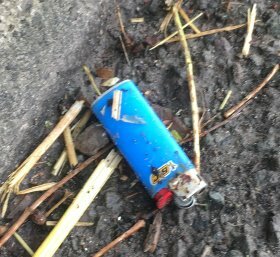 Lighters - Use matches or a refillable lighter. Razors - The combination of steel and plastic cannot be recycled. Use an electric razor, or a safety razor with replaceable blades. see the video . Cutlery - Keep a set of travel cutlery with you at work or in your bag to avoid plastic cutlery. Or buy Milk in Big Plastic Bottles; a 4pint bottle will stay fresh for a week in the fridge, and uses half the plastic of four 1pint bottles. 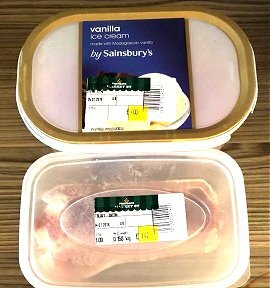 Take a plastic storage box (preferably re-using an ice-cream tub or similar) to the butcher or fishmonger, so they don't need to wrap it for you? Morrisons put their checkout barcode sticker on your container, so you can just scan it like any other item. You also get 100 loyalty points worth 10p. Avoid food sold on Black Plastic Trays. Recycling scanners generally can't 'see' black plastic items. Buy food sold on lighter coloured trays, it will help motivate the suppliers to change. Buy refills for glass jars (e.g. spices, coffee), liquid hand soaps, wipes. Shops that still offer free plastic bags; ask them to stop proffering them, and provide only when asked. (Make an end to "Would you like a bag for that?" ). Show them this list of alternative bag suppliers. Buy Butter and Margarine in foil rather than tubs. Instead of Cling Film, save food left-overs in old ice-cream tubs. But don't fret about cling film; recycling a single 4-pint milk bottle, saves as much plastic as 10 metres of cling film. Buy Shampoo Bars instead of bottles. e.g. Lush . The Independent's review of shampoo bars . Plant Pots. The 500 million plastic pots we use in the UK each year, generally contain up to 98% recycled plastic, so they have been round the system once already, but black plastic cannot be 'seen' by most recycling systems, and ends up being burned for energy recovery. However, a new recyclable taupe (grey) pot is being trialed. You can help by asking for them at your garden centre. 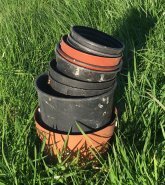 The Horticultural Trade Association is offering garden centres a black plastic collection service. Does your garden centre offer this service to customers? Impose a tax on single-use plastic items - bottles, cutlery, straws, take-away food containers? 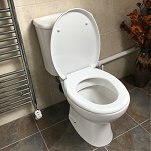 Toilets cause 7% of plastic pollution on beaches. Toilets are for Pee, Poo, and Paper. Get a bin in your bathroom for wipes, tampons, condoms, plasters, dental floss, cigarette ends, etc. Wet Wipes: Switch to bio-degradable, not just 'flushable'. e.g. Waitrose, Boots and Andrex. (The labelling is sometimes confusing, with the wrapper itself marked as non-recyclable plastic). 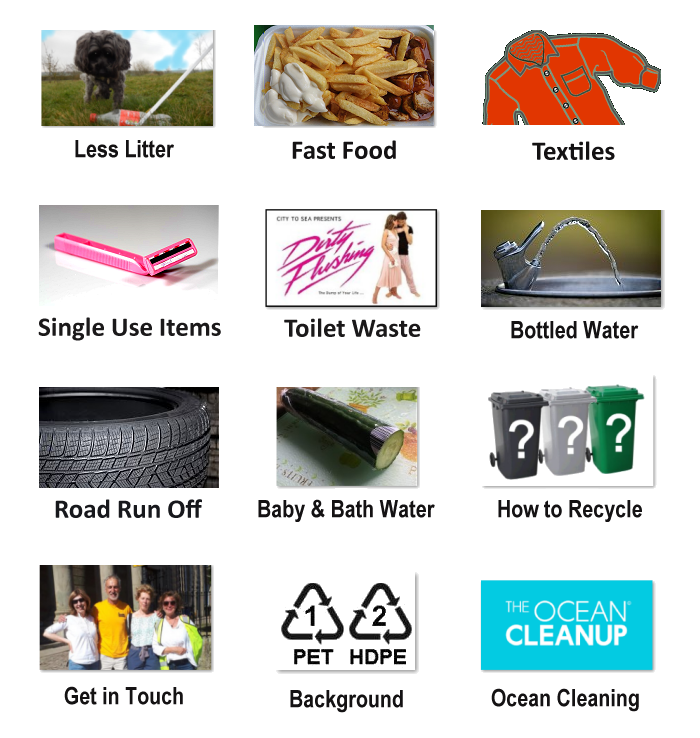 Surfers Against Sewage have a Plastic Free Coastlines campaign and downloadable starter pack. 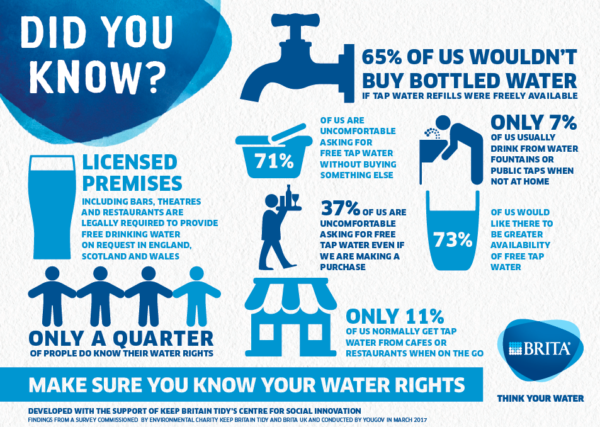 Can you engage with your local water company? It's in their interest to reduce filter blockages. 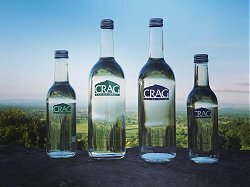 Water accounts for almost 20% of soft drink bottles sold in the UK. 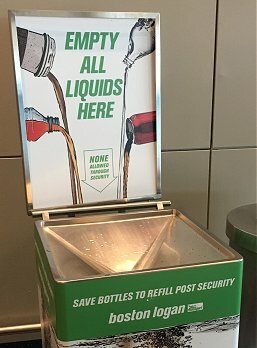 Make public water fountains available to re-fill bottles? Ask your council and local employers to install them. Persuade more local business owners to offer free refills and join the Refill scheme. (See the map right). Download the App from Refill.org.uk to locate free water near you. Dispel the Myth that plastic water bottles are dangerous to re-fill. 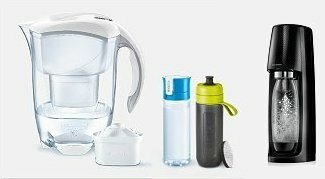 Try using a filter jug at home or a filter bottle on the go. If you like Sparkling Water, consider buying a SodaStream with reusable bottles. When your tyres wear out, you probably don't wonder where the rubber went. Sadly, the answer is mostly into roadside soil, or into drains, rivers and the seas. 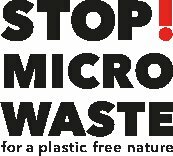 Micro-plastics are defined as particles less than 5mm in diameter. 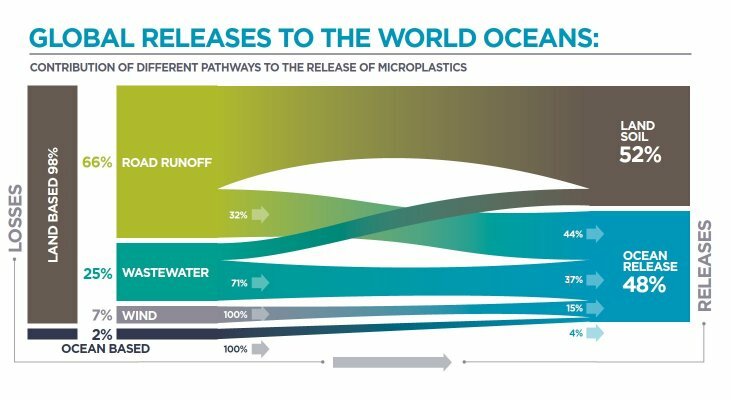 Progressing from left to right, the graph below shows how most micro-plastics (98%) originate on land rather than the ocean. 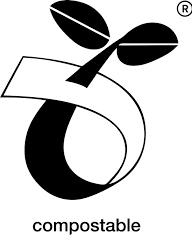 Land based activity produces :- Road Run Off (66%), Waste Water (25%), and Wind borne dust (7%). These components take a variety of routes, but ultimately half stays in the soil and half gets into the oceans. 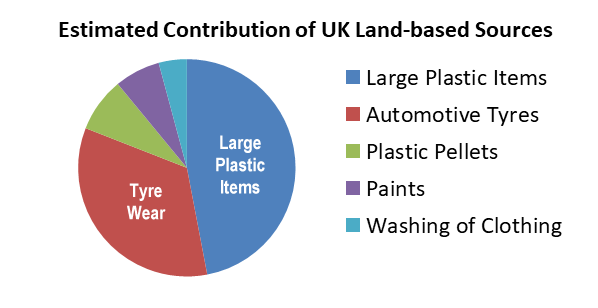 Tyre abrasion is estimated by Friends of the Earth to be the second largest source of plastic pollution - after 'Large Plastic Items', and eight times bigger than that from clothes washing. There are some specially designed roadside gullys now that aim to collect this material, but the vast majority of existing gullys have limited capacity, and can be flushed out in heavy rainfalls. What can you do? Apart from raising awareness of this problem, there is not much an individual can do, apart from choosing tyres that claim longer life, and driving as you would to save fuel. Don't carry excess weight or a roof rack. Accelerate, steer and brake gently. Walk, cycle, car share or use public transport. 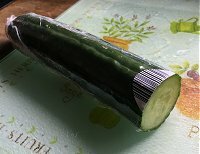 Plastic wrapping around a cucumber trebles its fridge-life, and reduces food waste - a source of methane gas in landfill. Replace plastic bags for fruit and veg with paper bags? This good for plastic pollution, (If a paper bag escapes into the environment it biodegrades very quickly, whereas a plastic bag degrades hardly at all), but The Environment Agency have calculated that paper bags are worse for global warming - unless they are used four or more times, but that was unlikely to happen, due to the poor durability of paper bags - particularly if they become wet from leaks or condensation on chilled food items. Glass bottles are heavy to transport, and more liable to break into dangerously sharp pieces. If you want to be able to squeeze or see the contents of a container, there are almost no alternatives to plastic. Plastic packaging (padding and foam) prevents damage to goods in transit - another source of waste. Unlike metal, plastic items don't rust or need (toxic?) paint coatings. Don't replace durable plastic items with 'greener' equivalents; plastic disposal is what we seek to avoid. Do not burn plastic - it needs 2 seconds above 850 deg. C to avoid producing toxic dioxins. This can only be done in commercial incinerators. Recycling is more about conserving resources than pollution reduction. Any rubbish put into the local 'Waste Management System' will indeed be managed - with the worst case being landfill. However, since the introduction of the Land Fill Tax of almost £90 per tonne, everyone in the waste management industry is highly motivated to recycle as much as possible. Increasingly, the worst case is incineration to generate electricity for the national grid. Even then, the resulting ash is sifted for recoverable metals, and the remaining ash is used for road-building. In Cheshire East only 5% of all rubbish goes to landfill. Overall, recycling has improved from 17% to 55% in a decade. Silver bin contents are taken to UPM at Shotton. The site principally recycles newspaper and magazines; other materials including mixed paper and cardboard, are separated and shipped elsewhere for more processing , mostly quite local to Shotton and all within the UK. What cannot be reused, is burned for energy recovery. Black bin contents are sent to MES Environmental at Stoke for energy recovery. Metal is recovered from the ash, and the ash itself is used as road-building material. Green Bin currently garden waste only, but in late 2019 Cheshire East will have an in-vessel composter at Crewe, operated by Wastewise. You will be able to put food waste, including compostable cups, plates and cutlery in the green bin too. Currently food waste makes up around 40% of the average black bin contents. Rubbish taken to a 'Household Recycling Centre' (formerly 'The Tip') goes a different route, via H R Martin. The staff at these sites encourage visitors to put plastics in the right skip for subsequent sale to a recycler. Our rubbish is divided into an extensive range of recycling categories:- garden waste, general waste, wood, chipboard, white goods, TVs and computers, bicycles, scrap metal, paper, cardboard, batteries, fluorescent lamps, builders' rubble, three separate colours of glass, oil, and plastic bottles. Commercial waste collection is partly undertaken by the council, and partly by private contractors such as Henshaws, Veolia, Viridor , Fresh Start and Biffa who all have their own materials recovery systems. Waste Cooking Oil from cafes and restaurants is collected by Olleco (seen here at the Wizard Tea Rooms, Alderley Edge. 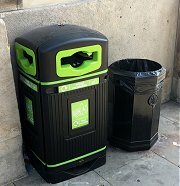 Waste in Litter Bins is not currently sorted, but Macclesfield Town Council have introduced recycling bins in the town centre. Their success will depend on clarity of signage, and goodwill on the part of the public to separate their deposits. Description of the sorting process at UPM Shotton here . The quick rule of thumb is to put only plastic items which you can crush in your hand into the silver bin; otherwise use the black bin. If you want to know more: Follow the Guidance on Cheshire East's website, and on the flyer. This advice aims to strike a difficult balance between simplicity, and completeness; High Peak Borough Council use the same recycling company, and some people prefer High Peak's advice for recycling plastics in their brown(!) bins. 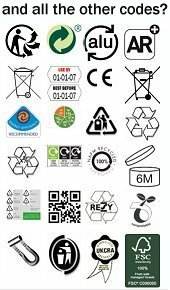 Use the Recycling Codes moulded into plastic items to avoid uncertainty about what to do with "Hard Plastics". Unfortunately, there is currently no market for some recycled plastic grades; they end up being burned for energy recovery. Recycled PP (code 5) yoghurt pots, tubs, and trays have no resale value today, but please do continue to put them into the silver bin as instructed - as we expect this situation to change for the better in due course, and in the mean time, the silver bin energy recovery costs less than black bin energy recovery. If in doubt, put items in the black bin, or call 0300 123 5011 for advice. 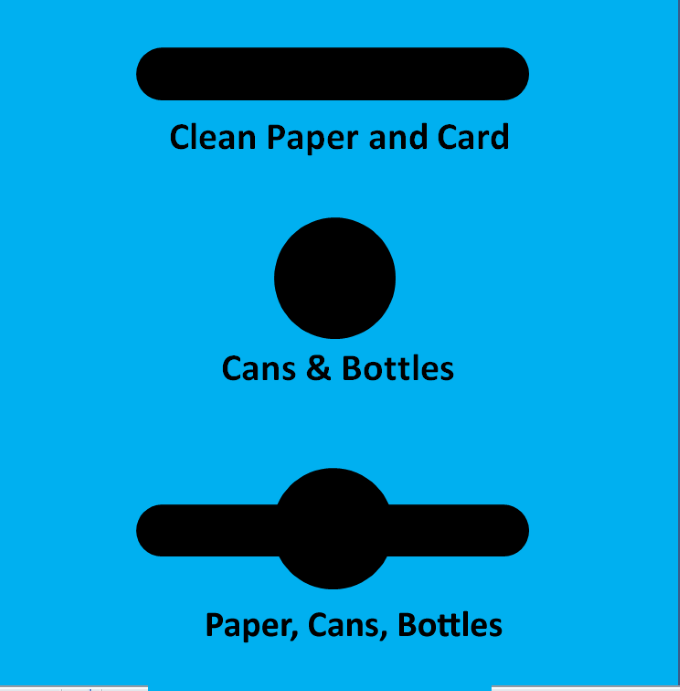 Bottle tops are best left on the bottle, so they don't fall by the wayside in the journey to the recycling plant. Squeeze the air out of drinks and milk bottles, so they occupy less space and don't roll off the conveyor in the recycling plant. Refit the cap tightly to keep them squashed in, and stop broken glass etc. getting inside the bottle. Rinse. You don't need to be too fussy about washing your recycling, but a quick rinse will stop it becoming smelly. Do avoid leaving much food in containers - so that it doesn't leak onto paper in the same bin, and make that un-recyclable. Coffee Cups CAN be recycled in Cheshire East. You must tear the cup, breaking the wax seal and allowing the chemicals used in paper making to 'get under the skin'. Plastic bags go into the Silver bin. The film usually comprises several layers of different polymers that can't be separated for reuse in any way, but the bags are used for energy recovery. Cling film should go in your black bin - it is generally too contaminated, and represents very little plastic. A 4-pint milk bottle has the same amount of plastic as about 10 metres of cling film. Books generally contain too much glue in the binding for making into new paper, but telephone directories contain so much paper they are acceptable. Books are a mixed blessing to charity shops. Some books can be sold for 50p-£1; The Ziffit App uses your phone to scan barcodes and give an instant value to some books; Everything else goes to World of Books earning the charity only 2.5p per kg. (that's 0.6p for a paper back, or 3p for a coffee table book). Clothes, Textiles and Shoes are not recycled from the wheelie bin collection, but you can take them to banks at various locations:- London Road Co-op, Duke Street Car Park, Tesco Hibel Road, Sainsbury's, Westminster Road Shops. H&M have now started a clothes recycling scheme. Arrange a Free Talk or workshop by Ansa or Cheshire East for your community group or school. Don't Bin it; Donate it. Try a local Charity Shop. Small plastic toys, clothes, and bric-a-brac are well received. Local Groups such as Freecycle or MaccRecycle will generally put you in touch with someone who wants your item and will collect them within hours. Scrap Metal: The silver bin can accept only cans, but Henshaws will buy quite small quantities of scrap metal, car batteries etc. For example copper is bought for about £1.50 per kg. Aluminium 40p, Lead 65p, Car Batteries 30p (about £4 -£6 per battery). Because I care about the environment. Because everyone else in my local community recycles. Because I feel bad about throwing things away. A group of people working towards a brighter more ecologically sound future for the town of Macclesfield, Cheshire East, UK. 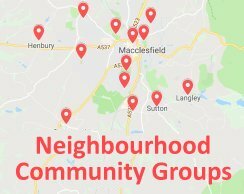 If you are interested in plastic pollution, or the broader issue of Sustainability in Macclesfield, Macctastic has set up six working groups interested in Litter Picking, Helping small retailers to recycle more, Plastic Reduction, Pollinators, a Repair Cafe, Tool sharing, and Transport. The next public meeting is at 7.30pm, on 20th May, at St Michael's Church, Macclesfield. For more information visit www.macctastic.org or the Facebook Group. Transition Bollington's Facebook Page and website . Feedback on this website enquiry@notjustonce.org . Publicity: Some big guns are being brought to bear on this problem. Sky have an Ocean Rescue page and a separate Ocean Rescue website both with lots of videos. 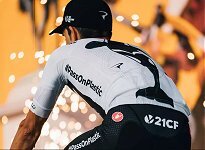 Chris Froome and their Tour de France team rode with #PassOnPlastic team strip. a separate Plastics Watch Section. and a series of three iPlayer Radio talks about the origins of our plastic use, and the solution. Note: Cheshire East use a recycler : UPM at Shotton. The Shotton site principally recycles newspaper and magazines; other materials including mixed paper and cardboard, are separated and shipped elsewhere for more processing at other UK based sites. 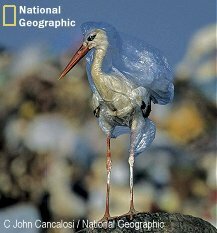 Plastic is not one material, but a family of many different types. The amber coloured cells below show those that float in water. The green cells on the right show the only grades that have a recycling value. The lower value grades tend to be burned for energy recovery. Bio Plastic: Generally plastic made from plants. It can have the same properties as plastic made from oil, (i.e. not easier to recycle) and there is concern that it could take land away from food growing. Only about 40% is bio-degradable. Bio-degradable Plastic: Another mixed blessing; can degrade into small plastic particles that are particularly undesirable in sea water, and (because it degrades) if it is put in with recycling, it reduces the quality of the recycled plastic (!). Compostable, Industrial: Bio-degradable plastics can be composted, but generally do not bio-degrade in domestic compost heaps or in the natural environment - they need the higher temperatures found in an 'In Vessel Composter' such as the one Cheshire East are building at Crewe and due to go into service in 2019. Compostable, Home: Some lightweight films used in plastic bags and wrappers are approved for composting at home. They tend to be made from starches such as potato, and break down at lower temperatures. Micro-plastics are pieces smaller than 5mm in diameter. Primary micro-plastics are pieces that were made that small when new (such as fibres); secondary micro-plastics are the result of erosion of larger pieces. PCR - Post Consumer Recycled Plastics: Using old plastic items to make new plastic is key to the Circular Economy. Wikipedia has a good section on Plastics. It is detailed but well structured, making it easy to skip to what you want to know. 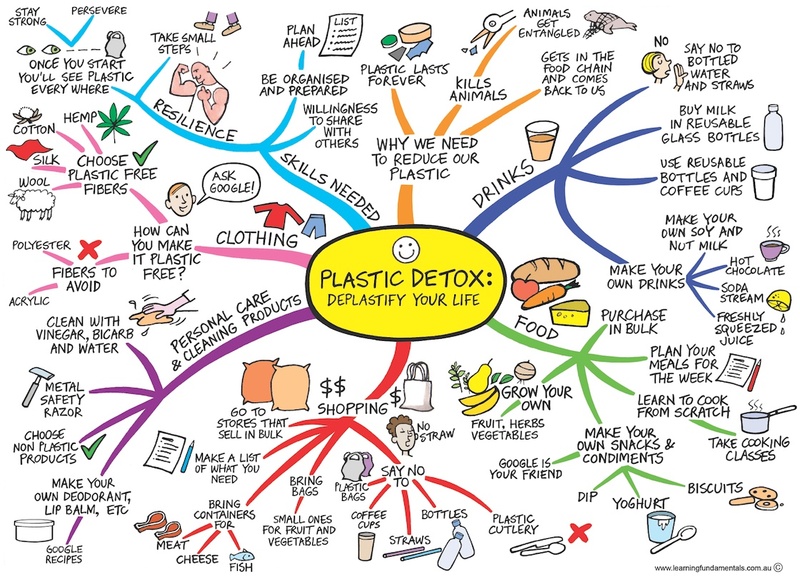 SLOactive have an informative webpage on the facets of plastic pollution. Nearly two-thirds (63%) of consumers were frustrated that different councils collect waste in different ways. Three-quarters (73%) of the UK public said they would like more transparency on what happens to their waste. Only half (49%) were very confident they put different waste in the right bins. 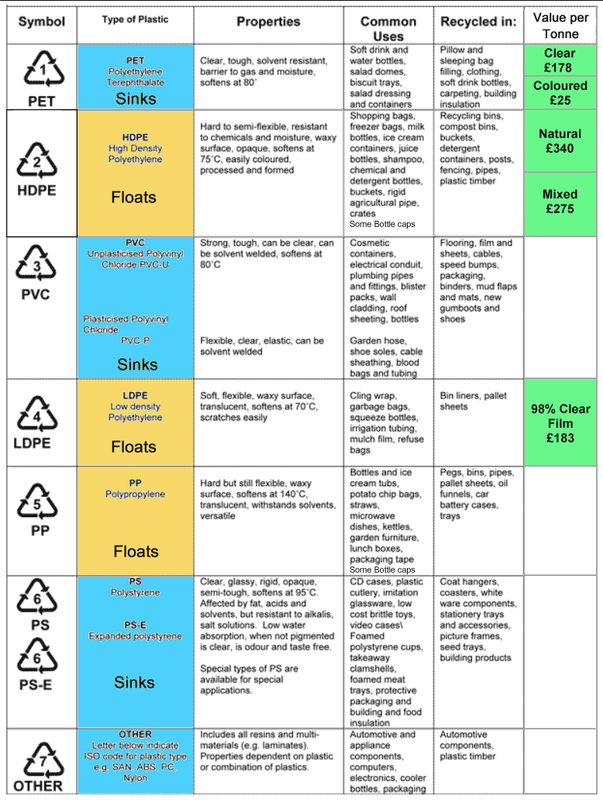 Plastic Facts published by the Association of Plastics Manufacturers. 40% of plastic goes into packaging. Only 4 to 6% of all the oil and gas used in Europe is employed in the production of plastic materials. 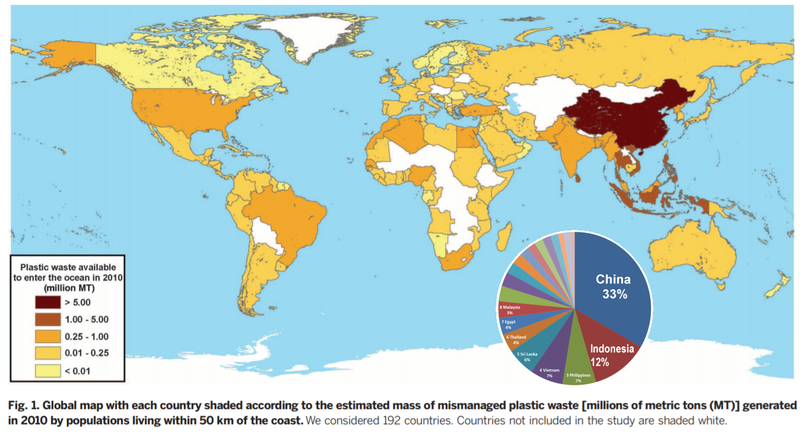 (in Asia where 50% of plastic is made, it may be more). Across Europe, of all the plastic waste that is collected 30% is recycled, 30% goes to landfill, and 40% is burned to recover energy. Plastic packaging recycling rates are higher at around 40%. What about Cleaning up the Oceans? What are the Gyres, what's in them, and why not just clean them up? Micro plastics are pieces less than 5mm in length, mostly broken down fragments of larger items, that tend to float below the surface, turning the sea to soup. theOCEANCLEANUP. is a project to put slow-moving booms in the gyres to gather the drifting plastic for easy harvesting. A report published in Nature, March 2018 , states that in the Great Pacific Garbage Patch gyre, over three-quarters of the plastic mass was carried by debris larger than 5 cm and at least 46% was comprised of fishing nets. Micro plastics accounted for 8% of the total mass, but 94% of the estimated 1.8 (1.1–3.6) trillion pieces floating in the area.